Other than as categories, art terms like ‘representational’ and ‘realistic’ aren’t very helpful. The weightlessly floating, elongated figures of Byzantine mosaics ‘realistically represented’ the spiritual truth so important to those who lived in the dark age that followed the fall of Rome, that souls and eternity mattered more than the here and now . . . or the there and then. Similarly, the floating, diaphanous figures, the fiddler on the roof or the flying barnyard animals, so beloved by fans of Marc Chagall represented—no matter their metaphoric extension—the tenuous, fragile nature of life for Jews in Central Europe, in the century before Hitler wiped them off the face of the earth. Most art ‘re-presents’ something seen or experienced in another form or medium, usually pretty obviously, and the more important question is what is being presented by the representation. In other words, what content is contained in the subject matter. Two bodies of work by two familiar, if not yet widely known, local figures, being shown this month in the Dibble Gallery, demonstrate the contrasting sides of this aesthetic divide. Both have shown recently in the non–commercial (or at any rate, less commercial) galleries that are vital to Salt Lake and Utah having such a vibrant art scene: Wilson at the City Library, Vorm at Finch Lane. While neither artist’s works require arcane knowledge to appreciate, both offer the satisfaction that rewards both contemplation and the kind of familiarity that comes from living with art. Claire Wilson challenges viewers to make the most basic distinction: to tell the artwork from the materials it’s made of—not unlike the late Art Danto’s comparison of an artist’s red painting and an identical red rectangle sawn off the side of a barn. Danto’s choice of an architectural example proves particularly apt in Wilson’s case. 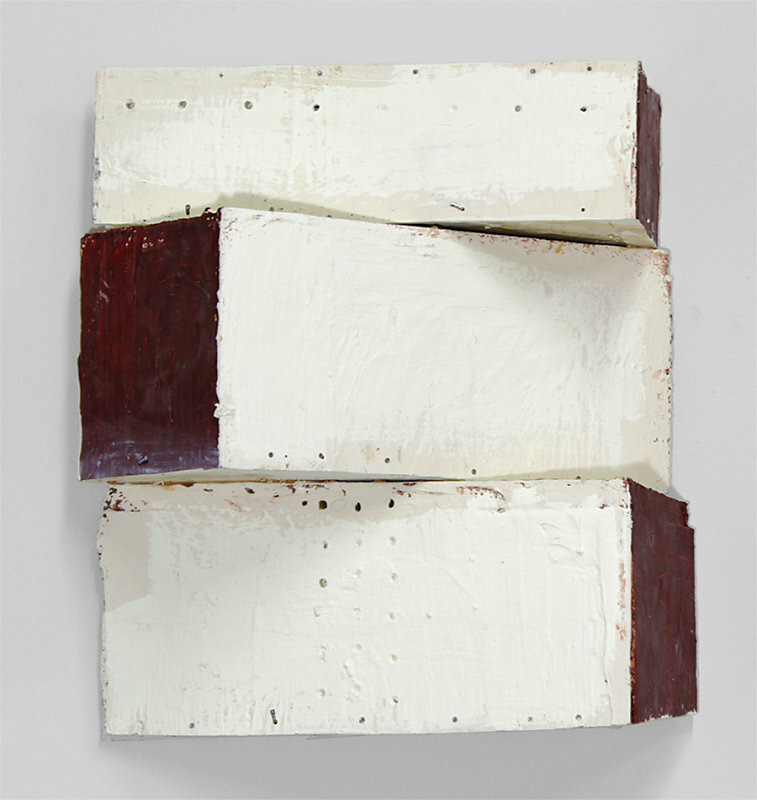 Wilson’s objects, which she likes to keep as close as possible to the ever-shrinking borderline between sculpture and painting, hang on walls but could otherwise be confused with the builders’ discards that accumulate around construction—or demolition—sites. To say that seeing them for the first time, on the Library’s gallery walls, was intensely exciting, or to add that the intensity hasn’t diminished, is to acknowledge that Wilson has picked up on a neglected subject matter and a raw source of formal activity that combines deliberate and stochastic creativity, in ways both lively and unlikely. Here we find deliberate fashioning of visual and tactile qualities that seem only to come about by accident, heightened and elevated by deliberate manipulation. The accumulation of layers and the juxtaposition of contrasts are among her topics, to which end she has brought more color into ensembles that are less tightly rectangular than what she showed last time. Anyone who’s ever smashed an old box flat to fit in the trash and stopped, seized by the expressive power of the resulting detritus, should immediately grasp the point of these meticulously-fabricated, deceptively crude-looking fragments. They’re probably not for feint-hearted or lightweight appreciation, though someone with no art training at all might find them easier to get—or be gotten by. That said, the sheer sophistication of their visual appeal will combine with the ironic humor of their references to keep them warm and welcome long after more accessible and more easily liked works have lost their appeal. That tickle might well be enough, but for those of a more philosophical bent, or those who marvel at the interplay of seemingly deliberate design and accidental fabrication that marks all of ‘creation,’ one of these talismans promises to offer an inexhaustible starting point for further thought. Consider this: biologists’ best guess is that many of our species’ most important features, like vision or the upright posture that makes our hands useful, evolved initially for other purposes, only to turn out accidentally to have far more wide-ranging effects. One part of the resonance of Wilson’s work is the sense that there is something right about this—that a construction made for a functional, if unknown purpose, can come to be recognized as interesting in its own right, even useful in a completely unexpected way. Of course this is only one possible analogy to her artworks. Another viewer might look at, say, either of the Diagonal Objects, and after trying to conjure the missing extensions beyond these joints, think about how what is present can tell us about what is absent. 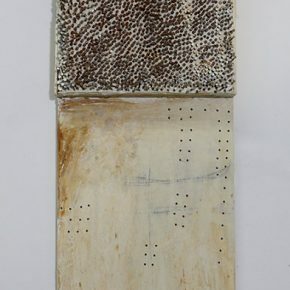 Those two works boast linear patterns of holes, but several that share the title “Coded” alternate nails and what the viewer assumes are nail holes without the nails. 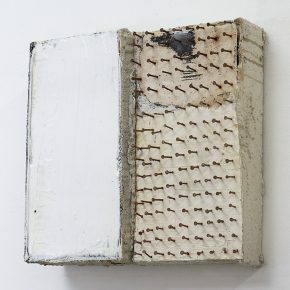 According to the artist, all of them come about in sequence, each a response to the preceding, and each undergoes a material transformation, starting with a hands-on exploration of wood, putty, plaster, metal, and other materials that begin as themselves, become representations—sometimes of themselves and sometimes of something else—and then return to themselves. Or, as she calls it, “true / false / true,” a pendulum process that can begin and end at any point. 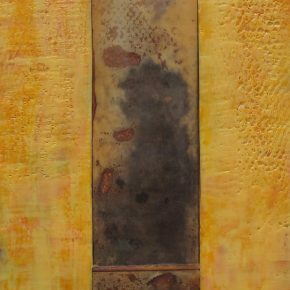 Claire Wilson uses the term “sublimation” to describe one of her artistic ideals: the elevation of raw material into work of such excellence it achieves a kind of transcendence. Before the Romantics got a hold of it, though, to sublime meant to transform a solid into a vapor without going through any intermediate state. So perhaps what is so immediately gripping about these works, for those open to their direct, un-prettified approach, is how they perform this trick, going from indulgence in base matter—lumber, nails, concrete, plaster, paint—to reveal how pure cognition, in the form of natural, categorical distinctions, prepares us to think allegorically, so that a joint in a structure comments on how ideas hold together. It’s not a literal process; words are not important to Wilson’s art, though she is almost as adept with them as with hand tools. It is rather a process that moves sublimely from literally mute objects directly to felt understanding. 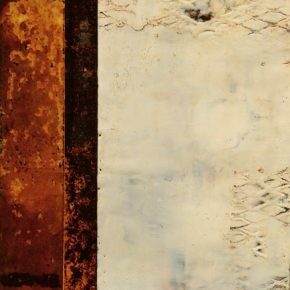 Almost exactly a year ago, Nancy Vorm’s astonishing, virtuoso array of rust and wax on paper squares and scrolls covered the walls of Finch Lane and hung in the spaces between, proving her seemingly endless versatility. Then as now, Vorm’s approach to art making, while seen often enough on this side of the Atlantic, lacks the identity given it in Europe. There the adjective “Concrete” designates work that would be lumped in with “abstract” art here, even though its “images” have no real-world correspondent from which they have been abstracted. “Pure design” might be our second-best guess, but that’s too slight a term for works that transcend surface arrangement to become real objects. 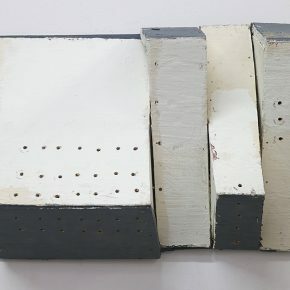 Those who saw Vorm’s show at Finch Lane will notice dramatic changes; those who didn’t may compare several works—notably “Elusive Façade” and “Perpetual Motion”—present here to mark the transition from that period in her work to the direction she’s taking now. Instead of paper made translucent and elusive by un-tinted wax in a palette of yellow through red to brown, here bright or deeply-colored layers of solid, yet still luminous wax are seen to form shallow reliefs that refuse to lie flat. It’s as if the two extremes of her previous work, the sculptural and the print-like, have been compressed together into hybrids energized to spring apart like repelling magnets. It’s an effect that cannot be seen in a photograph, although of course few art objects work as well in photos as they do in person. 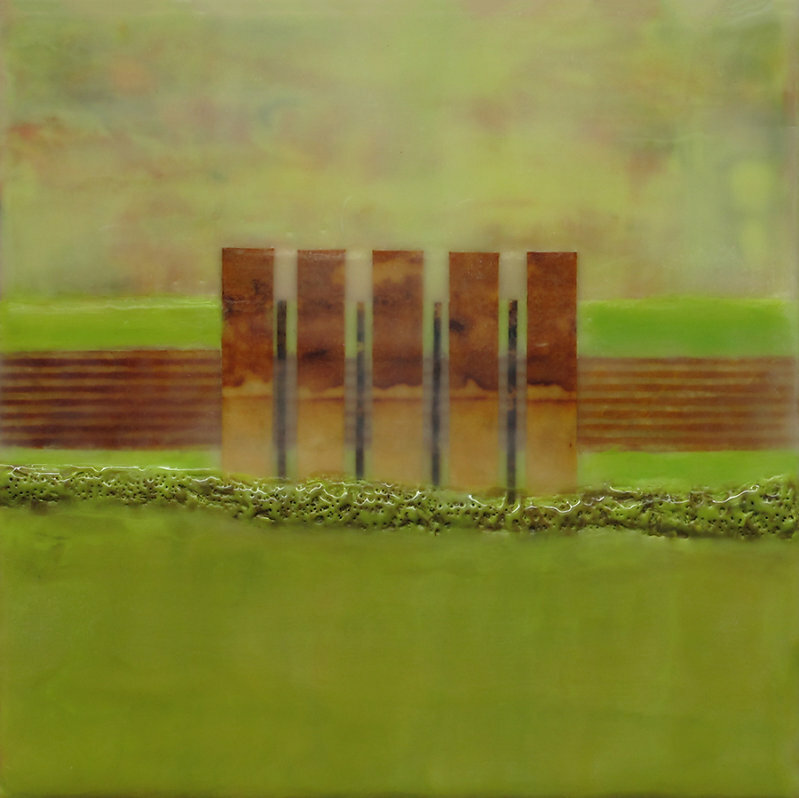 The nearest parallel for Encaustics like these is probably stained glass, another light-filled medium that liberates color to float forward and back in space—an optical phenomenon that may also be observed sometimes on cathode ray tube computer displays. The end product—at least on the wall—is a complex pattern that comes to life in the eye of the beholder. They don’t have the real-world references that give true abstractions—those that draw on nature, typically—their rich associations, but neither are they bound to those associations. At their best, they become paradigms of mental principles, like eidetic images or dreamscapes, that can never quite be fixed in the mind, but are fixed here to the degree possible. In two-person shows, it’s often the custom to show the artists separately, or to balance paintings with sculpture. 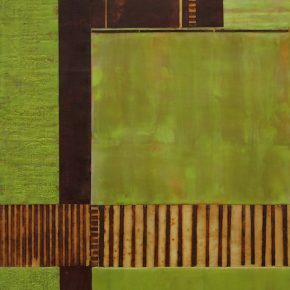 Nancy Vorm and Claire Wilson have chosen to intermingle and alternate their works on the same walls. While Vorm’s new works are actually a bit less like Wilson’s than they were a year ago, they have much in common. No one could confuse them, yet they share an allegiance to surface and its penetration, to materiality and craftsmanship, that make them appropriate companions from which to begin journeys to what will almost certainly prove two very different, individually satisfying destinations. New works by Claire Wilson and Nancy Vorm opens in Phillips Gallery’s Dibble Gallery (444 East 200 South, SLC) Friday, April 17, 6-9 pm and continues through May 8. Geoff…thanks for looking, considering & critiquing!